The historic Absecon Lighthouse in Atlantic City, New Jersey was built in 1856 and stands 171 feet tall. You'll find it on Rhode Island and Pacific Avenues, not far from the Atlantic City Boardwalk. It's no longer being used for navigation purposes and has now been turned into a museum that visitors can enjoy. If you would like to visit the lighthouse I suggest checking out their website for their current hours of operation. It varies depending on the season of the year. Visiting the replica inn keeper's house (museum) and gift shop is free. If you want to enter the lighthouse and climb the 228 steps to the top you'll have to pay an admission fee. 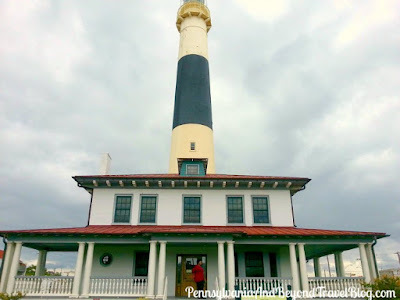 One of the things I love about this particular lighthouse is that when you climb the steps to the top, you'll be treated to some breathtaking skyline views of Atlantic City, the Atlantic Ocean and the surrounding area. The stunning views are well-worth the admission fee and climb! 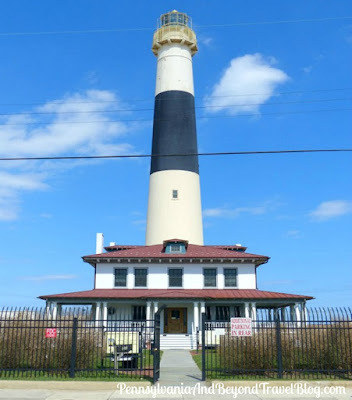 The Absecon Lighthouse is the tallest lighthouse in the state of New Jersey and is one of the oldest (still standing) lighthouse in the country. It has been beautifully preserved for all of us to enjoy. Once your done visiting the lighthouse, you'll want to checkout the onsite gift shop where you can pick up some gifts and souvenirs. Love lighthouses? Check out all of the New Jersey Lighthouses right here on our blog!